Extensively revised and updated, with the addition of new chapters and authors, this long-awaited second edition covers all aspects of clinical data management. Giving details of the efficient clinical data management procedures required to satisfy both corporate objectives and quality audits by regulatory authorities, this text is timely and an important contribution to the literature. * contains new chapters on systems software validation, database design and performance measures. It will be invaluable to anyone in the field within the pharmaceutical industry, and to all biomedical professionals working in clinical research. 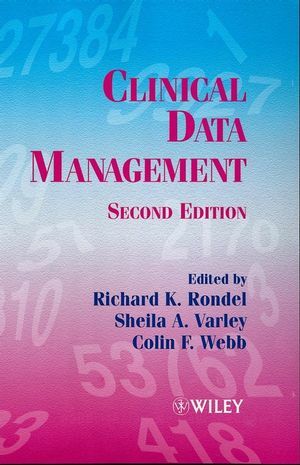 Richard K. Rondel is the editor of Clinical Data Management, 2nd Edition, published by Wiley. Sheila A. Varley is the editor of Clinical Data Management, 2nd Edition, published by Wiley. Colin F. Webb is the editor of Clinical Data Management, 2nd Edition, published by Wiley. The International Conference on Harmonisation and its Impact (B. Smith & L. Heywood). Case Report Form Design (M. Avey). Planning and Implementation (C. Thomas). Quality Assurance and Clinical Data Management (H. Campbell & J. Sweatman). Coding of Data-MedDRA and other Medical Terminologies (E. Brown & L. Wood). Database Design Issues for Central Laboratories (T. Tollenaere). Systems Software Validation Issues-Clinical Trials Database Environment (S. Hutson). Re-engineerng the Clinical Data Management Process (S. Arlington, et al.). Working with Contract Research Organizations (K. Buchholz). Data Management in Epidemiology and Pharmacoeconomics (M. Ryan & A. Pleil).